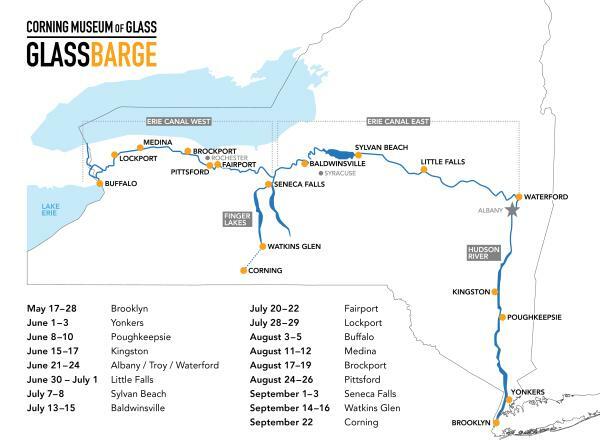 The Corning Museum of Glass (CMoG) today announced the schedule for GlassBarge, which will offer free public glassmaking demonstrations at each scheduled stop during its four-month tour, launching on May 17 in Brooklyn Bridge Park. It will then travel north on the Hudson, then westward along the Erie Canal before making its way to the Finger Lakes. It will stop at ports in Yonkers, Poughkeepsie, Kingston, Albany, Little Falls, Sylvan Beach, Baldwinsville, Fairport, Lockport, Buffalo, Medina, Brockport, Pittsford, Seneca Falls, and Watkins Glen. A ceremonial last leg of the trip will take place by land, concluding in Corning with a community-wide celebration on September 22. GlassBarge commemorates the 150th anniversary of the Brooklyn Flint Glass Company—now known as Corning Incorporated—relocating to Corning via the New York Waterways by canal barge. In celebration of this pivotal journey, CMoG is recreating the voyage with GlassBarge—a 30’ x 80’ canal barge equipped with CMoG’s patented all-electric glassmaking equipment. In addition to sharing the story of glassmaking in Corning, the GlassBarge tour emphasizes the continued role of New York’s waterways in shaping the state’s industry, culture, and community. GlassBarge is the 2018 signature event for the statewide celebration of the Erie Canal Bicentennial.